The registration code included in this version is not compatible with the Steam version of FINAL FANTASY XIV Online. To play on Steam, please buy the Steam version of the game once it becomes available. 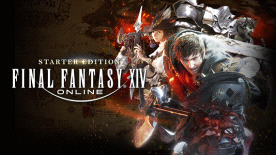 The PAL version of FINAL FANTASY® XIV will require a European & other Regions Square Enix Account to play. The NA version of FINAL FANTASY® XIV will require an Americas Square Enix Account to play. Please refer to our country list to check which key you will receive on purchase. To check what region your account is in, follow the instructions here.